A new challenger appears! IDW Publishing has provided ComicBook.com with an exclusive first look at the February 2016 solicitation for Street Fighter X G.I. Joe #1, bringing together two of pop culture’s greatest fighting forces. The 6-issue miniseries is written by Aubrey Sitterson, with art by Emilio Laiso. The story sees Destro and Bison bringing together Cobra and Shadaloo in an unholy alliance that only the combined might of World Warriors and the Joes stand a chance of stopping. Check out the official solicitation text and cover art below, and look for the first issue in comic shops and digital storefronts this February. ​​​​​​On a hidden island in international waters, 16 combatants enter a secret tournament… one that pits Street Fighter vs. G.I. JOE! 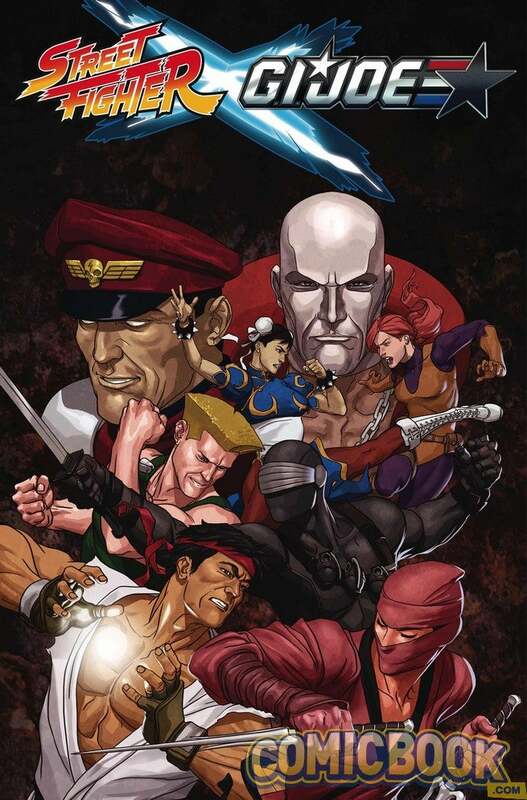 M. Bison and Destro have joined forces, and taking them down will require the world’s finest warriors: Ryu, Snake Eyes, Guile, Scarlett, Chun-Li and Duke. New challengers Aubrey Sitterson(Hulk, Superman, Tech Jacket, Worth) and Emilio Laiso (Hack/Slash: Son of Samhain) bring the visceral combat of the world’s most popular fighting game series and the real world military action of America’s fighting elite together for the first time! ZOMG! What matchups would you like to see?